Think Asian street food. Think hot, sweet, crispy, salty and sour flavours. Think Kitsch Bar. Located along Oxford Street in Leederville, is Kitsch Bar, a very popular eatery famous for their food bursting with flavourful Asian inspired street food flavours. I have heard so much about Kitsch Bar and was excited to give it a try with Elwyn one night after smashing a BodyCombat class. We arrived at Kitsch and was lucky to be able to find ourselves a table without making a booking on a Wednesday night. The interior around Kitsch is creative and yet modern, with its mismatched furnitures and dimmed lighting at the courtyard. As the popularity of tapas style restaurants is booming in Perth, the food at Kitsch is designed to be shared. We started off with the soft shell crab and pork white corn tortilla with kimchi ($8). 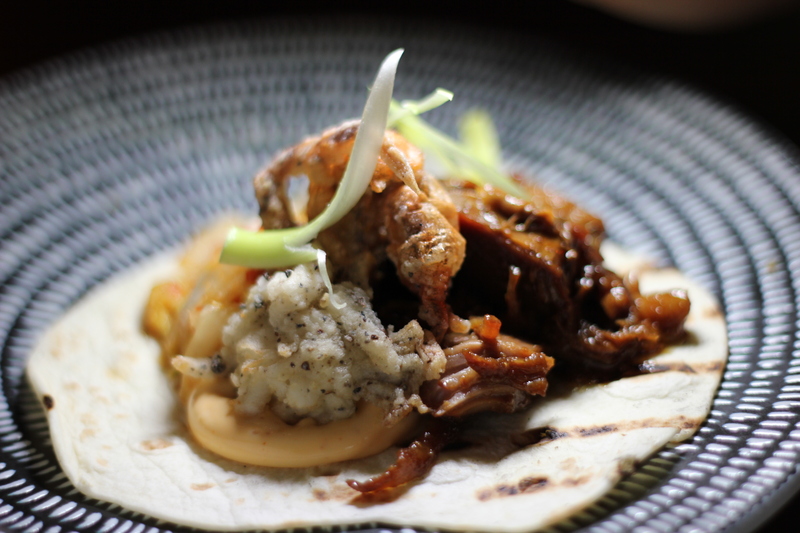 With one bite through the soft corn tortilla, there was a burst of flavours and crispy textures from the soft shell crab and the tenderness of the pork. Together with the kimchi, it gave a punch of spice and freshness to the tortilla. 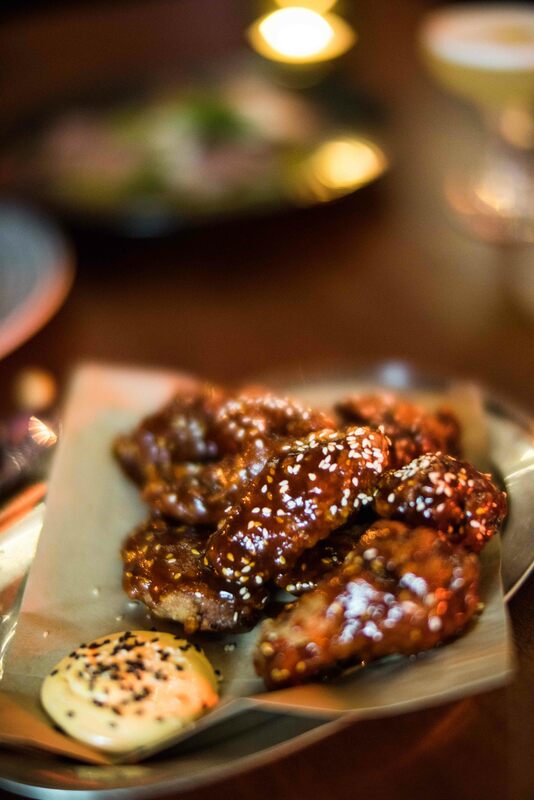 Another dish which our waitperson recommended us was the Korean fried sweet and salty chicken wings ($14.90). The chicken wings were marinated well, giving a punch of sweet and salty flavours with every bite. It’s crispy and crunchy on the outside too concealing the tender textures of the chicken. Next up was the chargrilled beef flank steak with green curry sauce ($ 26.70). 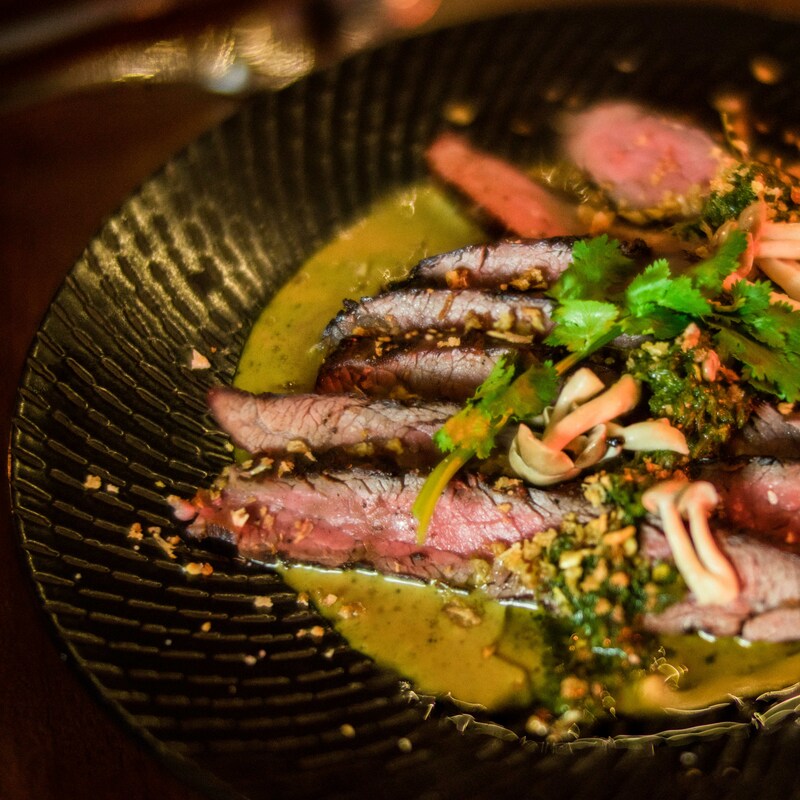 The green curry sauce was delicious and flavoursome together with the tenderness of the chargrilled beef flank steak. However, I thought that if the steak could be a little bit more juicier, it would have been even more amazing. 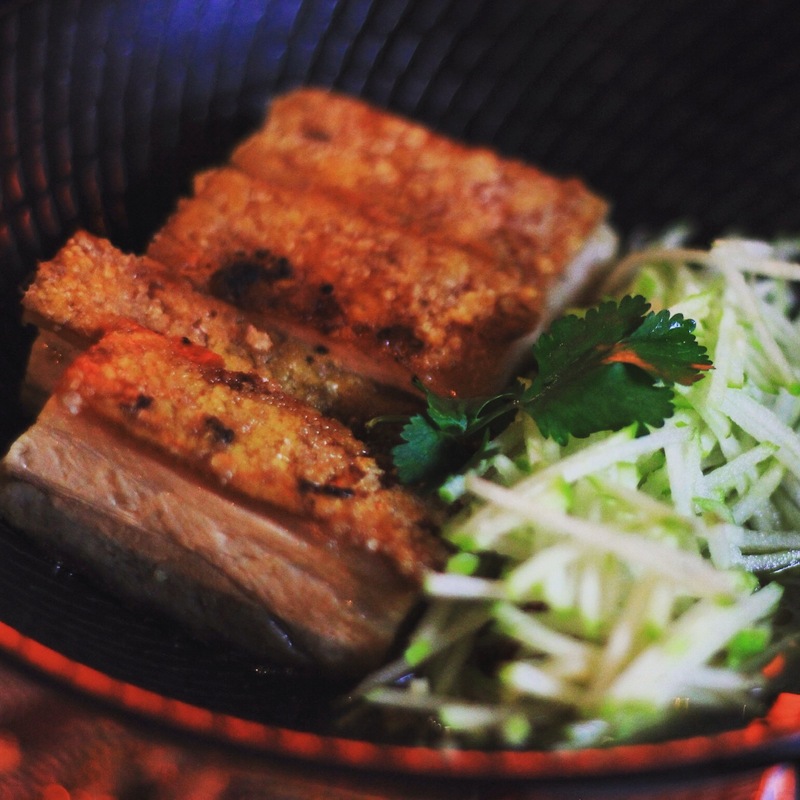 We enjoyed the crispy skin pork belly with chilli caramel & apple salad ($26.90). Whenever I think of pork belly, I always think of the top layer of crispy skin, followed by juicy and tender pork belly. Both of us agreed that the pork belly was delicious, with a crunch in every bite from the crispy skin. The chilli caramel gave a combination of spicy and sweet to the dish, along with the combination of fresh flavours from the apple salad, making the dish texturally well balanced. 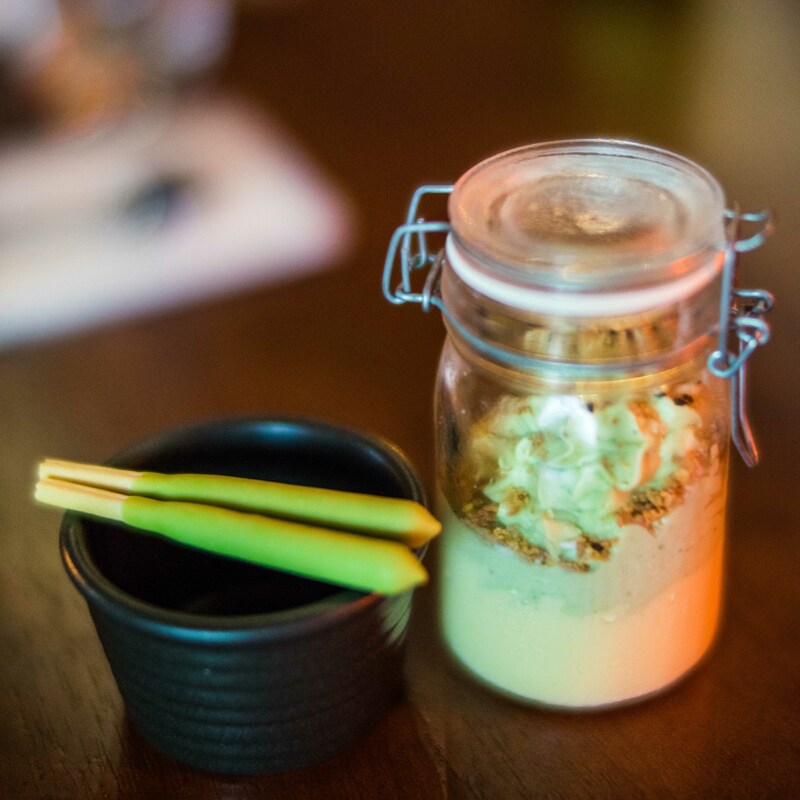 As a big fan of green tea, it was pretty easy to make a decision for dessert as my eyes focused on the green tea mousse with yuzu curd & roasted white chocolate ($12.00) on the menu. When the dessert arrived on our table, the two sticks of green tea pocky caught my eye immediately. The green tea mousse was smooth in texture and was not overly sweet, with subtle flavours of green tea. With every bite there’s a short burst of citrus-y flavours and a hint of sweetness from the yuzu curd. Overall, we enjoyed the food at Kitsch and were quite full. The service was excellent – friendly and attentive. Considering how busy it was on a Wednesday night, our food did not take too long to arrive at our table. With a clever play on executing a perfect combination of flavours, Kitsch Bar is the place to be to share food around the table while bringing you memories of street food in Asia.